Below is the basic Hardware architecture suggested for using Interactive. 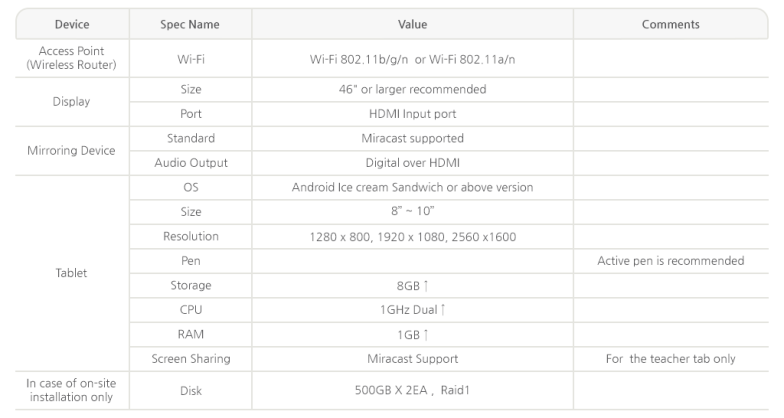 Below are the hardware specifications recommended for the Interactive operation. An example for mirroring a device (In case of using Samsung Allshare cast dongle and Galaxy Note 8.0) A suggested device is the Samsung Allshare Cast Dongle which connects to the display via HDMI cable that will mirror the teachers device via WiFi. There is an HDMI port, a power port and a reset button on the back side of the dongle. The Allshare Cast is Miracast customized for Samsung products. Miracast is a technology to mirror device screens on a TV or a monitor seamlessly via a Wi-Fi access point.